Reading the Historical Books: A Student’s Guide to Engaging the Biblical Text: The title tells you what the book is about and the book, itself, is equally clear. Author Patricia Dutcher- Walls is a professor of Hebrew Studies at the Vancouver School of Theology and she blends her academic knowledge with an ability to write clearly and in an engaging fashion about the historical books of the Bible. This book is not a commentary, nor a book about ancient near eastern history, nor an introduction to the Old Testament. This book’s purpose is to help readers understand the writing styles, writing conventions,historical context, and the cultural and theological assumptions of the first audience. Dutcher-Walls explains how the historical books tell us stories which are in some ways similar and in other ways different than modern stories. She shows how the author’s theological point of view is expressed through the stories. The aims and goals of ancient historical writing are not the same as modern historical writing and this book explores and explains those differences. Recognizing that biblical texts are persuasive writing rather than neutral sources of facts is important to reading the historical books well. Dutcher-Walls uses examples from the Bible and from other ancient texts to illustrate her points. Using other ancient texts helps the reader understand the ways the Biblical authors use the style and writing techniques of their time. She also makes excellent use of modern examples in movies and television to explain important concepts. For example she uses the content of a text message to explain how context and culture affect our ability to understand what we are reading. This book is well written with a clear and engaging style. There are a few discussion questions at the end of each chapter that are good for church groups and book clubs as well as the classroom. The focus of the book is on the historical books of the Bible- Joshua through Ezra-Nehemiah. However the basic ideas contained in this book will also be helpful when reading other parts of the Bible. This book will enrich your reading of the historical books of the Bible. Posted in Bible, Book Reviews. 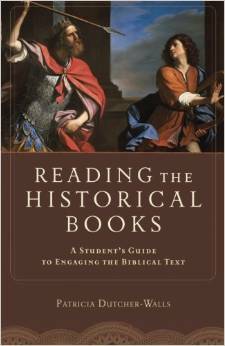 Tagged biblical history, Biblical interpretation, Patricia Dutcher-Walls, Reading the Historical Books. Previous: Previous post: Wasteful or Extravagant?